Superintendent Chris Le Fanu returns to Madras from Penang where he leaves his new Straits Chinese love interest, Jenlin Koh, and a tempting new post in police intelligence there. 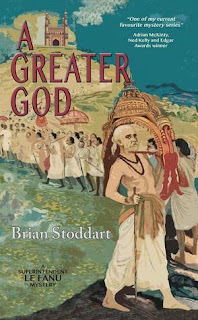 He finds Hindu-Muslim tension on the rise in Madras, and his friends and subordinates Mohammad Habibullah and Jackson Caldicott at loggerheads as a result. A series of Muslim murders around the Presidency adds more tension. Le Fanu's arch enemy, Inspector-General Arthur "The Jockey" Jepson is reacting recklessly to the new conditions, then Le Fanu has to travel to Hyderabad where his former housekeeper and lover Roisin McPhedren is seriously ill. Le Fanu swings between his personal and professional challenges as a gang of revolutionaries and Hindu nationalists from North India travel south to aggravate the troubles. Le Fanu and Jepson clash head-on as the latter causes several policemen to be killed, and Le Fanu is losing support because his main civil service protectors are leaving Madras. Just as he seems close to overcoming all these problems, news arrives that Jenlin Koh is on board a ship reported missing near Ceylon. How will Le Fanu cope? It is 1925 and Superintendent Chris Le Fanu has returned to Madras from the Straits a greater godSettlement, fending off multiple job offers while trying to work out who is on a killing spree targeting Muslims, and which romantic relationship to pursue.